Besides the big rear wing, this FR-S looks like a stock Scion two-door sports coupe. Until the driver plants his foot and the thing screams down the track. It's packing a 2JZ and plenty of extra modifications under the hood. 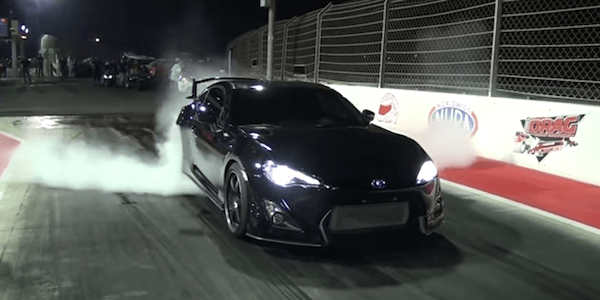 The Scion heats up his tires and gets the car staged and is ready to see how fast the FR-S is. Watch the video below. The Scion FR-S runs the quarter mile in a very quick 9.10 seconds. So what does this Scion FR-S have packed under the hood? To see more runs down the strip and see what’s under the hood, check out the video below. According to the video description, this FR-S is running a stock 2JZ block, but as major modifications that include: “Precision 6262 turbo, Hypertune intake, custom four-row intercooler, 3.5-inch custom down pipe and exhaust system.” It seems to be a good combination on this ultra-fast Raven Black Scion FR-S sports coupe. The 2016 FR-S rear drive sports car does not get any changes to the powerplant or drivetrain. The sports coupe is powered by the naturally aspirated 2.0-liter Subaru boxer engine producing 200 horsepower. Power is sent to the rear wheels by way of a six-speed standard gearbox or a six-speed sequential automatic transmission with paddle shifters and...read more.